The moon is constantly moving in and out of the 12 zodiac signs so depending on where she’s at, there are efforts you could be doing to maximize any given phase. This pocket sized book is a companion to all of the lunar cycle work you’re doing. For 28ish days, you are given a prompt to help you stay aligned with your passion, purpose, and profit. Use this workbook by your lonesome or get a bunch of your entrepreneurial tribe together and leverage this planner for your mastermind. 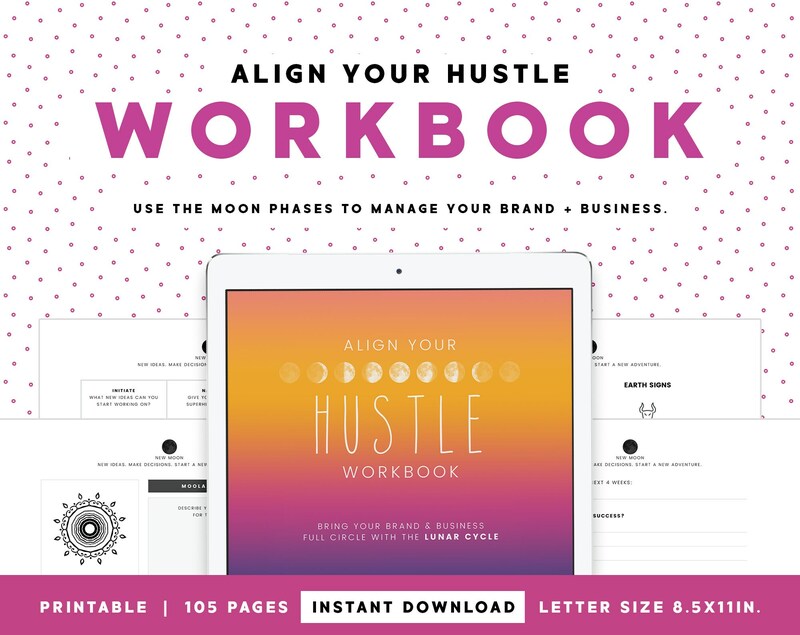 The ALIGN YOUR HUSTLE WORKBOOK covers one full lunar cycle, approximately 28ish days, so that you can meditate, organize, and manage your hustle with intuition and cosmic guidance! This listing is for the INSTANT DIGITAL DOWNLOAD version of this workbook. You will not receive a physical item with this purchase. If you would like to integrate this workbook into your coaching practice, connect with me and we can discuss a collaboration. I'm down for creating alliances! However, distribution and resale of this digital download for commercial purposes is strictly prohibited. If you want to use them with your personal mastermind group, go for it but do not in anyway try to pass off the workbook as your own.